When I was on a big city fire department, we often had to roll out of bed in the middle of the night and respond to fires. Because you are doing this quickly and half asleep, you got in the habit of putting your gear in the same place every night. I still have this habit. Before I go to bed, my clothes are always arranged in the same place and everything is in my pockets. I don’t leave my wallet and keys laid around. Everybody who keeps a firearm or other weapons available to grab for self defense normally develops a bit of a routine. For many of you the firearm may always be on your person or within reach. In an emergency, this can save your life. But so can always knowing where your car keys are. Locking your doors is another good habit. How many people do you know who leave their doors unlocked all day, where anyone can walk in. Now I am not saying that you should develop a set routine in which you always leave the house at the same time through the same door. What I am saying is that if you get in the habit of putting important things in their place so that you can always find them, this is a good habit to develop. I bet as you are reading this post most of you know where there is a weapon with which you can defend yourself. But where are your car keys, your shoes, and your bug out bag? Are your doors locked? Develop good habits; they may save your life. This entry was posted in Uncategorized and tagged habits, Howard. Bookmark the permalink. Leave your clothes and weapons where you can find them in the dark. Long also wrote an eassay on survival in the 50s that covers about 9/10ths of what is out there today. Heinlein was a man. Do you know where we can get a copy? Expanded Universe “How to be a survivor.” Ace is the publisher 1980. 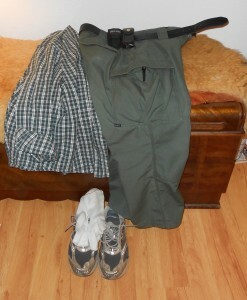 I’ve always kept an “evac bag” hung over the bedpost, which is my everyday carry with flashlight, wallet, watch, checkbook, cell phone, hat, gloves, walking shoes, water bottle, windbreaker and a full set of clothes, so if i only had seconds to get out in a fire, I would not have to stand in my bare feet and underwear in the yard. It is my everyday gear, so I always have a change of clothes and essentials with me. I worked 24 years as a “road warrior” and this system works well whether at home or in a motel away..